What? ....... Its Not Too Good To Be True? If you install an electricity-generating technology from a renewable or low-carbon source such as solar PV or wind turbine, the UK Government's Feed-in Tariffs scheme (FITs) could mean that you get money from your energy supplier. You can be paid for the electricity you generate, even if you use it yourself, and for any surplus electricity you export to the grid. And of course you'll also save money on your electricity bill, because you'll be using your own electricity. The large energy suppliers are required by law to provide FiT payments; smaller suppliers are not, but many have opted to offer them anyway. Watt Energy Saver can provide a list of FITs-licensed suppliers. For you to qualify for FITs, the installer and the products you use must both be certified under the Microgeneration Certification Scheme (MCS), except Solar PV >50kWp, hydro and anaerobic digestion which have to go through the ROO-FIT process. The tariffs you receive depend on both the eligibility date and, for solar PV<250kWp, your property’s Energy Performance Certificate (EPC) rating. The eligibility date is the date from which an installation becomes eligible for FITs payments. For most renewable electricity systems (with a declared net capacity of 50kW or less), this will be the date your FIT supplier receives a valid application for FITs. This will be after the date on which your renewable electricity system is installed, so it's essential to send your application to your FIT supplier promptly – for absolute certainty, use Royal Mail's Special Delivery. Export tariff: you will get a further 4.77p/kWh from your energy supplier for each unit you export back to the electricity grid, so you can sell any electricity you generate but don't use yourself. This rate is the same for all technologies. At some stage smart meters will be installed to measure what you export, but until then it is estimated as being 50 per cent of the electricity you generate (only systems above 30kWp need to have an export meter fitted, and a domestic system is unlikely to be that big). Once you are receiving FIT payments, the rate you get will increase in line with inflation in accordance with the Retail Price Index (RPI). 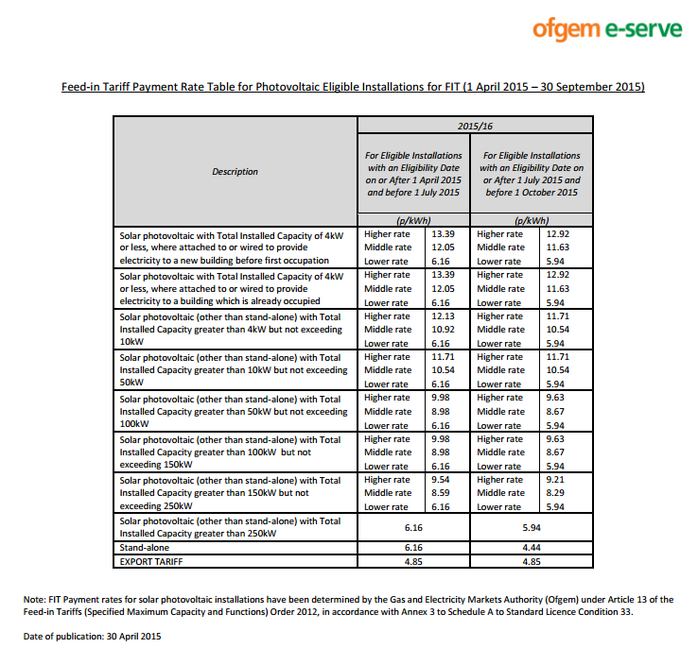 The tables below summarise the latest tariffs available for each technology.